Once it starts to show signs of tarnish and wear, old metal has a certain look to it that lends an air of distinction and class. For this reason, it's often desirable to artificially antique finish metal objects that look too obviously new. Pewter, in particular, has a bright, brand-new finish that can last for a long time. 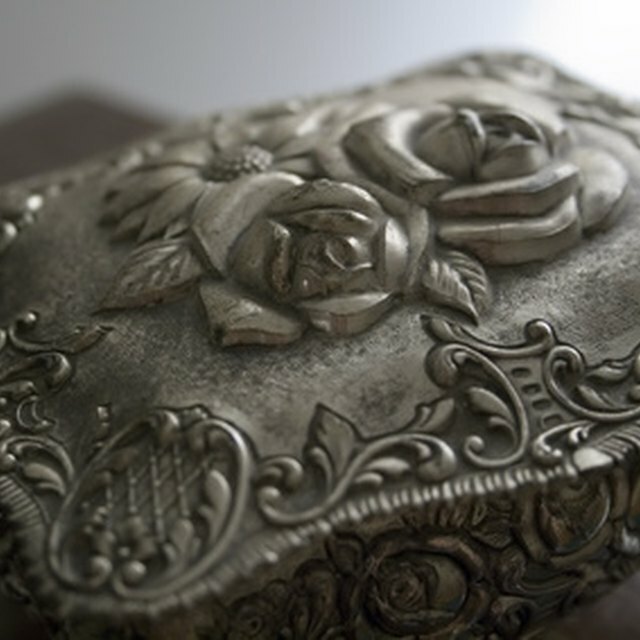 Giving pewter an antique treatment can make it look like a higher-quality product. Distress the pewter. Since pewter is so soft and pliable, you can easily make it look worn; put slight dings and dents using taps from a hammer and rough up some of the texture using sandpaper. Fill the paper cup with a few inches of water. The exact amount of water is less important for this process than making sure you have the right depth; make sure you have at least two or three inches of water. Add black spray paint into the water. Point the nozzle at the surface of the water and spray for thirty seconds. Give the mixture a quick stir with a mixing stick to disperse the paint in the water. The two will not mix, but you want to get small droplets of paint spread around as much as possible. Immediately apply the paint/water mixture to the pewter. Dip your craft brush into the mixture and try to get a distribution of mostly water with a little paint and spread it thickly over a small section of your pewter item. Wipe away some of the paint mixture. Use a rag to remove the bulk of the mixture. Tiny portions of paint will stick to the pewter, looking like tarnish. Repeat steps four and five with each section of pewter.